The Connelly Foundation and Freedoms Foundation at Valley Forge are natural allies. Education is the primary tie that binds. It has been a cornerstone from their beginnings – Freedoms Foundation in 1949 and the Connelly Foundation six years later. Both organizations see education as a pathway to success, for individuals and the nation. 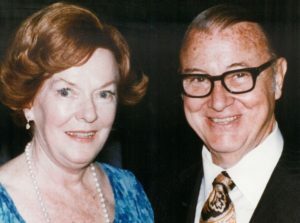 Founders John F. and Josephine Connelly emphasized support for Catholic schools and making higher education more accessible when they first charted their foundation’s course. To this day, the majority of Connelly funding is devoted to education-related causes. For Freedoms Foundation, the “teaching of patriotic citizenship,” as founder and guiding light Dwight Eisenhower put it, has been a top priority from the start. Thousands of students and teachers have taken part in Freedoms Foundation programs that create and build an understanding of the spirit and philosophy of the nation’s founding documents, emphasize both the rights and responsibilities of good citizens, and encourage all to serve a cause greater than themselves. At Freedoms Foundation, civics education isn’t merely about how government functions, but how, in a free society, engaged citizens from all walks of life work together for the common good, even if they are not always in agreement. It’s a mission that matches the values of the Connelly Foundation, and has resulted in more than $750,000 in grants during the two foundations’ decades-long partnership. John F. Connelly was a firm believer in the power of the freedoms guaranteed by the Constitution. They offered the opportunity for Americans to pursue their dreams, as he had. Born into an Irish immigrant family of modest means, he led two global-spanning enterprises, Connelly Containers, Inc., and Crown Cork and Seal, Inc. In turn, he defined success as being able to offer people the dignity of a job that would help them provide for their families. And just as Freedoms Foundation encourages students and teachers to not only serve their communities but lead, John Connelly also placed a great emphasis on leadership. And he was known for identifying and cultivating this quality in his workforce around the world, regardless of an individual’s background, race or religion. There was always room in the foundation’s grant-making for reacting to needs, but being proactive – What needs to be done? How do we move the needle? – was also important. So the vision and quality of an organization’s leadership could be just as instrumental in determining support as knowing how many people would be helped. One example of a leader with vision is Sr. Mary Scullion, President and Executive Director of Project HOME. Since 1989, Project HOME has sought to help adults, children and families break the cycle of poverty and homelessness through street outreach, support services, affordable housing, economic development, employment opportunities and health care. The Connelly Foundation is proud to have been the first supporter of Sr. Mary and Project HOME, which has grown into a $47 million per year nonprofit. Another example is Stanford Thompson, Executive Director of Play On, Philly, which strives to remove barriers to music education – tuition, quality instruments, professional teachers – by bringing lessons and supplies to schools throughout Philadelphia with no cost to students’ families. Thompson’s students consistently compete at the local and national levels and many study music in college or achieve careers as musicians, educators and mentors. It was an ethos first put in place by founders John and Josephine Connelly, and continued under the leadership of their daughters, Josephine C. Mandeville, President from 1990-2018 and currently Chair of the Foundation, and Emily C. Riley. They are responsible for transforming the Foundation’s grant-making to a proactive style encompassing joint programs and relationships with organizations such as Freedoms Foundation. Emily Riley is also responsible for the development of several key educational initiatives. Now, it is the next generation’s turn, with Tom Riley taking on the role of President in 2018, backed by trustees comprised of Connelly family members and others who broaden the board’s expertise and reach into the Philadelphia area community. Freedoms Foundation will present its 2019 Distinguished Citizen Award to the Connelly Foundation at An Evening with Freedoms Foundation on April 15. Keep up with Freedoms Foundation news and events here.